Fig. 2-6. Solar parallax. A' and B' are the apparent positions of the Sun among the background stars when the satellite is at A and B, respectively. The amount of shift is greatly exaggerated. synchronous altitude, and 0.29 deg at the distance of the Moon. Of course, these shifts are superimposed on the approximately 1-deg-per-day apparent motion of the Sun due to the motion of the Earth in its orbit. Finally, stellar parallax is the shift in the direction of very nearby stars (other than the Sun) due to the orbitai motion of the Earth about the Sun. Note: Stellar parallaxes are quoted as the shift in the direction of a star due to the motion of the observer (perpendicular to the direction of the star) of 1 AU, or the radius of the Earth's orbit Therefore, the maximum shift in stellar direction for an Earth satellite for 1 year will be twice the stellar parallax. The largest stellar parallax is 0.76"=2 X10-4 deg for the Sun's nearest neighbor, Alpha Centauri. Thus, stellar parallaxes are only of interest for very accurate star sensor work. 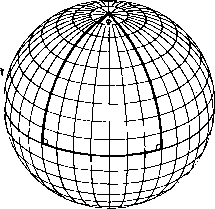 This section gives a brief introduction to geometry on the surface of a sphere. Appendix A contains a more complete collection of formulas than is presented here, including a discussion of differential spherical geometry, which is useful in analytic work. Recall that a great circle on a sphere is any circle which divides the sphere into two equal hemispheres. All other circles are known as small circles. Great circles are analogous to straight lines in plane geometry in that they have three fundamental properties on a spherical surface: (1) the shortest distance between two points is an arc of a great circle; (2) a great circle is uniquely determined by any two points not 180 deg apart; and (3) great circles are produced by parallel propagation on the surface of a sphere. Parallel propagation means that if we take a straight line on any infinitesimally small region of the sphere and continually extend it parallel to itself in small steps, we will generate a great circle. Spherical triangles and other spherical polygons are constructed from the arcs of great circles. A fundamental difference between plane and spherical geometry is that on the sphere all great circles eventually intersect. In particular, if we are given a great circle and construct two great circles perpendicular to it (at any distance apart), then these two great circles will intersect exactly 90 deg from the first circle. This is easily seen from Fig. 2-7 by thinking of the first circle as the equator and the second two as any two meridians. 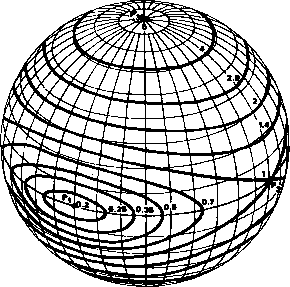 Of course, any great circle may be taken as the equator of a coordinate system. A second fundamental difference between spherical and plane geometry involves the sum of the angles of a triangle.. The sum of the angles of a plane triangle always equals 180 deg. However, for any spherical triangle, the sum, 2, of the rotation angles formed by the intersecting arcs is always greater than 180 deg. Specifically, the quantity (2-180°), known as the spherical excess, is directly proportional to the area of a spherical triangle. For example, consider the spherical triangle formed by the equator and two meridians in Fig. 2-7. Because the two angles at the equator are both right angles, the rotation angle at the pole, 4>, between the two meridians is equal to the spherical excess. Clearly, the area of the spherical triangle formed is directly proportional to the rotation angle at the pole. Although more difficult to demonstrate, this theorem is true for any spherical triangle. The fundamental figure for computations in spherical geometry is the spherical triangle, illustrated in Fig. 2-8. Recall from Section 2.1 that lowercase Greek letters are used for the arc length sides of a spherical triangle and uppercase Greek letters are used for the rotation angles. In spherical geometry, any three components, including the three rotation angles, determine a spherical triangle, although in some cases two triangle solutions may exist Given any three components, Appendix A presents formulas for determining the remaining components.